Tired of stuffing your dog’s Kong toy with the same thing each time? 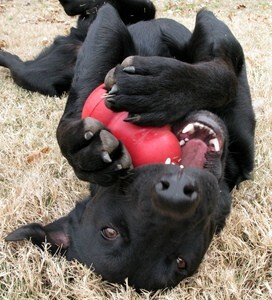 Good news!… There are several different things you can stuff into dog’s Kong toy. For starters, you don’t always have to use store-bought products. Homemade Kong treats are sometimes the best kind. And the variety is virtually endless. Your dog will love it! Here are lots of DIY recipes that make great Kong treats. My dogs love it when I put peanut butter in their Kong toys. I have to admit, I don’t stray from using peanut butter too often. Usually, that’s all I put inside, nothing but peanut butter. I’ve tried leaving out the peanut butter when filling their Kongs in the past, but they were never as excited with the Kong as when I fill it with peanut butter. Recently, I’ve been experimenting and adding other Kong treats along with the peanut butter. When you go to clean your dog’s Kong toy, do you have a hard time getting it clean? The first time I tried to clean out the Kong, I had a hard time getting all they way inside. I always had to run it under hot water for a long time to get the peanut butter out of it. Since then, I’ve inherited a baby bottle brush. Now I use that to clean way down inside the Kong toy.